Contactually gives you the tools to communicate with the right lead, at the right time, with the right message. In fact, according to data from Contactually, agents who use their platform close an average of FOUR more deals per year compared to the average agent that doesn’t use Contactually. What would you do with 4 more commission checks this year? In this tutorial, we’ll give you step-by-step instructions on how to use your free trial of Contactually to quickly and easily set up a killer relationship marketing plan to help you get more referrals, and close more deals. Categorize, organize, and prioritize your contacts. 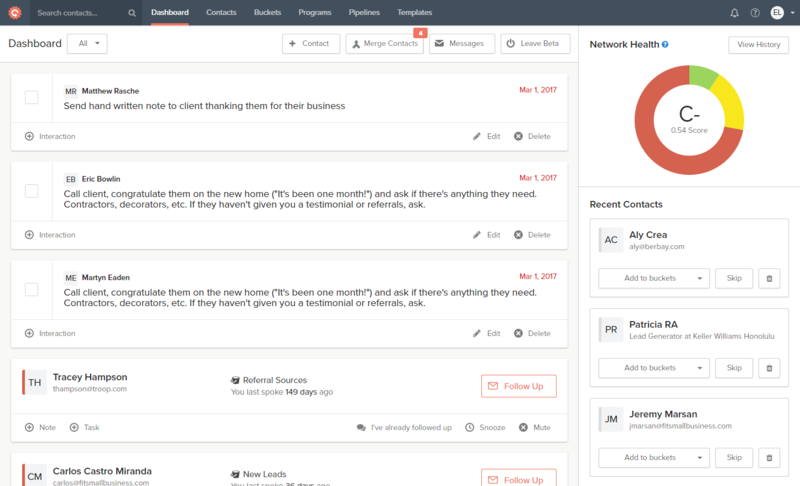 Buckets are Contactually’s contact management system. You can create as many or as few as you’d like, as well as set follow up reminders, and unique lead nurturing automation plans called Programs for each one. Automate your daily lead nurturing tasks. You can design advance programs that trigger follow up reminders, drip emails, and other tasks, and even change course based on how a contact responds. Reach out with the right message, at the right time. You can send A/B tested email templates designed to convert, or your own unique emails to whichever groups of contacts you want quickly and easily. 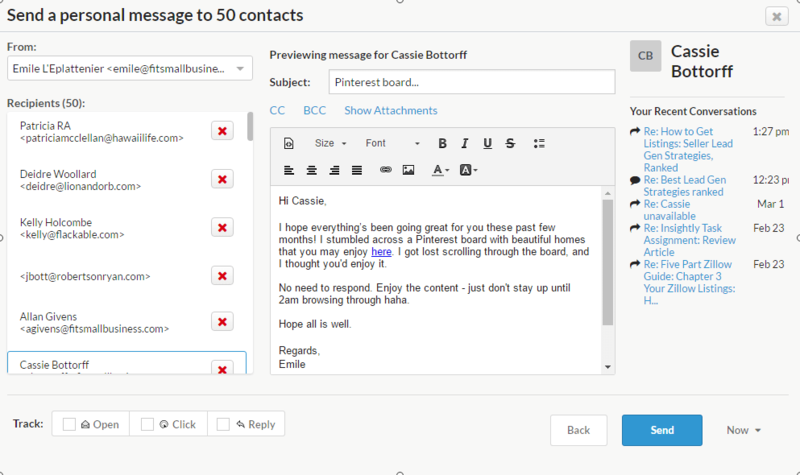 Even better, you can also customize emails for individual contacts on the fly. Track your progress easily with pipelines. You’ve probably heard of sales pipelines, but what about sphere of influence pipelines? With Contactually you can custom design pipelines to track your overall progress and glean quick, actionable insights from your performance. With Contactually’s Professional and Real Estate Accelerator plans, you can get a 30,000 foot view or dig deep into your own performance, or your team members or agents. Okay, now that you have a basic overview of Contactually, grab a cup of coffee and let’s dive in. Here are the steps on how you implement a CRM. The first step toward building your relationship strategy with Contactually is to get your free 14 day trial. Don’t worry though, since Contactually sits on top of your current email platform, you’ll be up and running in a snap. Click on your email platform below to install Contactually. While you can do a lot of amazing things with your free trial, there are certain features that are only available with Contactually’s real estate edition (called The Real Estate Accelerator plan) including more Scalemail templates, agent designed programs and pipelines, and more advanced team features. For the purposes of this tutorial, the free trial will work just fine. 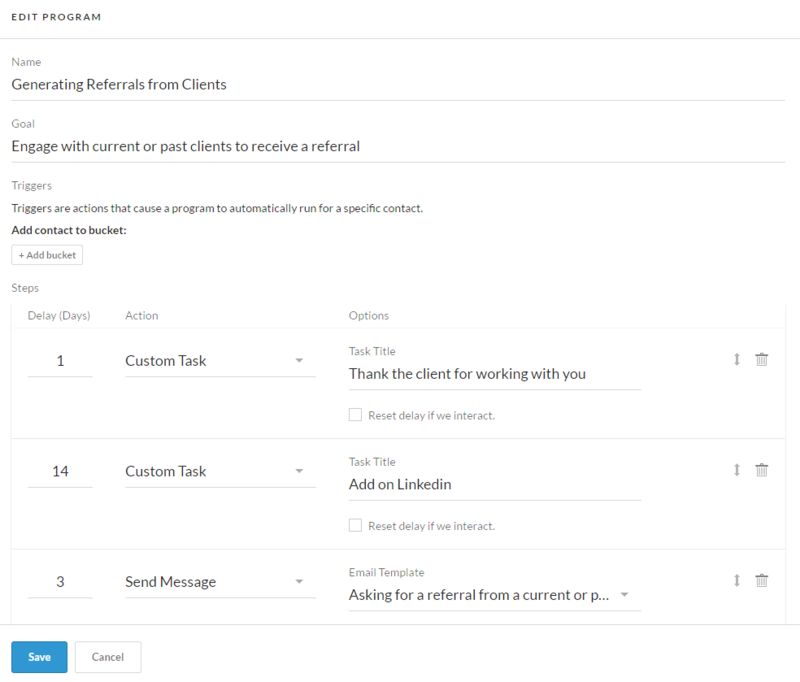 When you first launch Contactually you’ll be prompted to connect your email account in order to pull your contacts into your system. Select your email provider (Gmail, Office 365, Exchange Server, or Imap) and let Contactually work their magic to import your contacts. After your contacts are imported, you will be taken to your dashboard. Think of the dashboard as your personal Everest Base Camp. If you’re serious about relationship marketing, the dashboard will soon be the first thing you see every morning when you get to your desk, or fire up your tablet at home. Caveat: If you already signed up for the Professional, Real Estate Accelerator, or Enterprise plans, you will be able to schedule a free onboarding session with Contactually to walk you through setup. That said, their onboarding reps may not be available right away, so you can still use this guide to familiarize yourself with the system. Once your contacts are imported, there will be a message in the center of your dashboard prompting you to organize your contacts by playing the bucket game. While this may be tempting, before you start the bucket game, you should check out your buckets to see if they work for you. Go ahead and click on the “buckets” tab at the top of your dashboard. 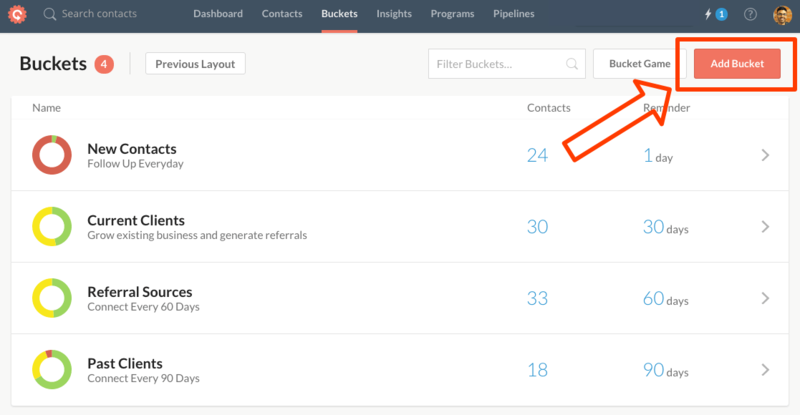 Buckets are Contactually’s way of categorizing, organizing, and prioritizing your contacts. If you’ve signed up for the Real Estate Generator Plan then you’ll have 18 buckets specifically designed for real estate already set up for you. If not, then you’re probably going to want to create some of your own. To give you some inspiration, here are ten of the 18 buckets that are included in Contactually’s Real Estate Generator Plan. I’m sure you have a few ideas for buckets of your own as well, so after checking out the list, write down the bucket’s you’d like to use, as well as how often you’d like to be reminded to keep in touch with the people in each bucket. Once you’re done, we’ll cover how to create your own custom buckets. To design their real estate platform, the Real Estate Accelerator Plan, Contactually consulted dozens of top producing agents and teams to create hundreds of powerful templates, programs, and buckets. Below are the top ten buckets that come pre-installed with the Real Estate Generator plan. Even though you won’t get these features with the Basic or Professional plans, you can always manually create them yourself or design your own. This bucket is designed for your most important referral source. Former clients that have already given you referrals and will likely give you more in the future so you need to follow up more frequently to maintain this relationship. This bucket is designed for former clients who have not given you a referral. This bucket is designed for everyone in your sphere of influence who have already given you a referral in the past. Your sphere of influence should include friends, family, former coworkers, vendors, local business owners, or any other non-client who might give you a referral. The SOIB bucket is for contacts in your sphere of influence who have not yet given you a referral. This bucket is designed for seller clients that have recently closed. With their Real Estate Accelerator plan Contactually offers automated lead nurturing (called Programs) specifically designed for recent seller clients. This bucket is designed for buyer clients that have recently closed. Contactually’s Real Estate Accelerator plan offers a program specifically designed for recent buyer clients. You can also design your own program for recent buyer clients. The open house leads bucket is setup to qualify leads you get from an open house. Contactually’s Real Estate Accelerator plan includes a program specifically designed for qualifying open house leads. You can also design your own program if you prefer. The new internet leads bucket is designed for all the leads you get from Zillow, Realtor.com, lead gen sites or any other online lead source. Contactually’s Real Estate Accelerator plan includes a program specifically designed to qualify new internet leads. Or, if you prefer, you can design your own. This bucket is for dead leads. By default, dead leads have a follow up reminder set for six months, which can then trigger a dead leads program. While you don’t have to put every single contact into a bucket, some very organized agents might want to file them away anyway. Use this bucket for miscellaneous contacts who you need to sort later. 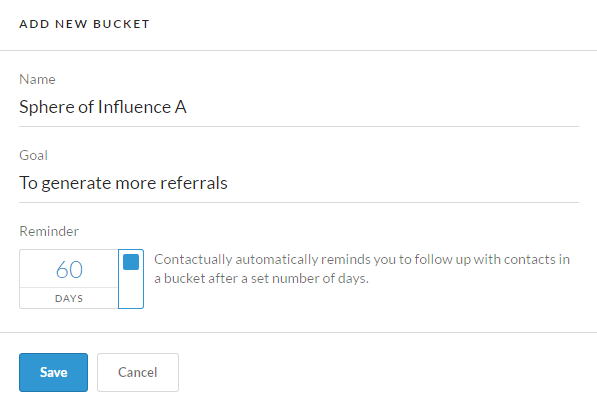 In order to create a new bucket in Contactually, just click on the “Add Bucket” button on the top right hand side of the buckets page. From there you need to name your bucket. Create a unique name that will describe the contacts that you will put in the bucket. For example, you may want to start a bucket called “Former Clients”, or “New Seller Leads”. Next, you’ll want to set a descriptive goal for the bucket. What do you hope to achieve from the contacts in this bucket? Something like, “nurture and grow this contact into a client” or “to generate more referrals” will get the job done. Finally, set a follow up reminder for the bucket. For example, for a sphere of influence contact, you may want to set your follow up reminder for 60 days. From now on, you will be prompted to reach out to people in this bucket 60 days after they’re added. Keep setting up new buckets until you have as many as you think you’ll need to organize your contacts. Don’t worry about getting them perfect, you can always add more buckets, or edit your current buckets as you tweak your outreach strategy. Okay, now that you have your buckets ready, the next step to setting up an effective relationship marketing plan with Contactually is to start organizing your leads by putting them in the right buckets. With most CRM, segmenting your contacts means hours of staring at a bland, excel-like interface and clicking tiny check boxes until your fingers bleed. I won’t name names, but this kind of drudgery is very common with most real estate CRM platforms. Luckily, unlike many software companies who shall remain nameless, Contactually likes you. In order to make segmenting your leads less like watching paint dry and more like something you may even enjoy, Contactually designed an easy, intuitive, and dare we say it, fun way to put your contacts into the right buckets. They call it the Bucket Game, and while it’s not quite as exciting as Grand Theft Auto, it’s a MUCH more pleasant way to spend an afternoon than segmenting leads the old fashioned way. Head back to your dashboard and click on the “Play the Bucket Game” button in the center of the screen. Contactually will now show you contacts you’ve been talking to recently. When they appear, click the bucket at the bottom of the screen you want to put them in. You can also use the keyboard and type the letter shown on each bucket. You need to think quickly otherwise the game will show the next contact in your list. Don’t worry though, you can pause the game at any time or press the space bar to skip a contact to bucket them later. By default one round of the Bucket Game will ask you to bucket 50 contacts. After you’re done, you can choose to play another round and add 50 more contacts, or quit and head back to the Dashboard. By the way, The Bucket Game is not the only way to bucket your contacts in Contactually. You can also import an XLS file, or better yet, get in the habit of bucketing new contacts from the dashboard immediately after getting their contact information. Okay, now that you’ve learned how to create buckets and use them to organize your contacts, it’s time to go over what is arguably Contactually’s most powerful feature: Programs. Programs are step-by-step custom built relationship marketing plans to help nurture your leads more effectively. For example, let’s say you want manage online leads from Zillow: You can design a program that will send them a qualifying email one day after you put them in your referrals bucket, then get a follow up reminder to call them if they don’t respond to your first email after a two days. If they still don’t engage, your program might have another reminder to follow up via text five days after the previous step. If the lead still hasn’t engaged, your program might remove the lead from your new online lead bucket and drop them into your dead leads bucket. Once they go into your dead leads bucket, this will trigger the program you designed for dead leads. If you signed up for the Real Estate Accelerator Plan, you can use the agent designed programs included with the plan. If not, you can design your own custom programs and assign them to whichever bucket you choose. Since there is no limit to the number of programs you can have in Contactually, you can get as granular as you want here. As you’re probably now thinking programs can be as complex or simple as you need them to be. Have a great idea for a program? Let us know in the comments below. Okay, now that you understand a little more about how programs work, let’s quickly run through how to design your own program. To get started, click on the Programs tab at the top of your dashboard. Next, when you’re on the Programs page, click the “Create Program” button on the top right hand side of the page. If you’re signed up for the Real Estate Accelerator Plan, you can also choose to add a program from the library of agent designed programs. The first step in designing your own program is to name it and define your goals. To get you started, let’s set up a simple former clients referral generating program. We’ll name the program “Generating Referrals from Clients” and use “Engage with current or past clients to receive a referral” as our goal. Now we need to assign our program to a bucket. Right below the “goal” section, click on “add bucket” to assign the program to a specific bucket. For our example, let’s assign the program to the “Referral Sources” bucket. Next, let’s set up the steps we want our program to take. Since we just closed the deal, let’s set the first step to call them in one day to thank them for their business. Click on the “Add Step” button to select “Custom Task”. Then, in the “Task Title” section, name the task “Thank the client for working with you”. Now we need to set the delay, in other words when we want Contactually to generate a reminder to complete the task. Go ahead and set the delay to one day by clicking on the “Delay (Days)” to the left of the action. Now after we close a deal, we will be reminded to call our contact and thank them for their business one day after they’re added to the referral sources bucket. Let’s add some more steps to the program to make sure we keep in touch with this former client to get a referral. Using the same steps above, create a second step with a custom task and call it “Add on Linkedin”. Let’s set the delay for this task for 14 days. Next, we might want to add a step that sends a pre-written email template to ask them for a referral. Let’s set this task for 3 days after we add them on Linkedin. Only this time, instead of selecting “Custom Task” as our action, let’s select “Send Message”. We can then select an email template from the library to send to our former client. 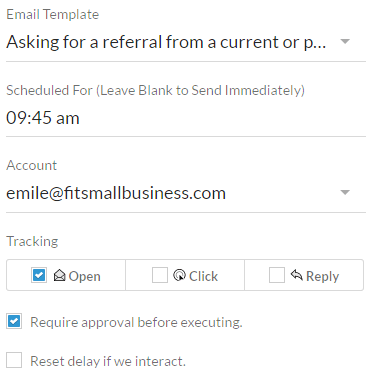 Even better, we can set Contactually to track opens, clicks, and replies to our email. We can also set the time of day we want the email to be sent, decide if we want to require approval before sending the email, or reset the delay for the email if we interact with the former client. Since consistent, targeted outreach is crucial for successful relationship marketing, Contactually built Scalemail, a bulk mail feature that let’s you reach the right lead, at the right time, with the right message. Like their bucket game, it’s also highly intuitive and a pleasure to use. Scalemail let’s you send unique or pre-written email templates to as many or as few contacts as you need. For example, you can send Scalemail to everyone in your Open House Leads bucket to tell them about a price change. Or, you can send a Scalemail to all the brokers in your system to invite them to your next open house. By the way, you don’t necessarily need a separate bucket for brokers, contractors, lawyers or Yankees fans. Contactually lets you “tag” contacts however you want no matter what bucket they’re in. So you can then send a targeted Scalemail using these tags. Scalemail also has custom fields and dynamic tokens that automatically adds each contact’s first name in the greeting (“Hey Sarah!”), and also lets you quickly and easily individually edit emails for some contacts, without changing the email template everyone else gets. For example, let’s say you had a great conversation about baseball with one of your open house leads. With Scalemail, you can drill down and edit their email message while still sending the boilerplate template to everyone else. Even better, there is no limit to the number of messages you can personalize in your Scalemail queue. You can choose to personalize all of them, some of them or none of them. Pretty cool right? Like programs, the possibilities for creative outreach using Scalemail are only limited by your imagination. Buckets: You can pick one bucket, or multiple buckets to send a Scalemail. Status: This is the status of your relationship with your contacts as measured by Contactually. Status is graded from strong (you’re keeping up with all follow up reminders and staying in touch regularly) to fading, to weak (you’ve very rarely followed up with this contact). Tags: Tags are like a more granular version of buckets. For example, you can tag all the real estate agents in your contacts and Contactually will pull everyone tagged as an agent from all your buckets. Companies: What company your contacts work for. Deals: You can pick a deal and Scalemail everyone involved in the deal. Locations: Your contact’s location. You can send Scalemail to anyone who lives or works in a certain city or neighborhood. Assigned to: If you have the Professional or Real Estate Accelerator plan, you can choose to Scalemail all contacts assigned to a certain team member or agent. Connected to: All the contacts connected to a specific agent. Frequency: When you last interacted with your contact, when they were added to Contactually, or the number of times you contacted them. Accounts: The email account associated with your contacts. For simplicities sake, let’s send out a Scalemail to people on our sphere who we haven’t talked to in more than a month. In the Filters tab, click on the SOIB (Sphere of Influence B) bucket, then scroll down to frequency and choose a date range that’s 30 days in the past. Next, click on the Red Scalemail button at the bottom of the page. Now we can either write a personal email, or choose from our template library. Since I’m using the Real Estate Accelerator Plan, I’m going with a fun template inviting people to check out a Pinterest Board (You can’t go wrong with Design Milk) I’m enjoying. From here I can edit the email however I want. Since I like this message, I’m just going to change the link to Design Milk’s Pinterest Board. Once you’ve edited your email to your liking, click “Next”. On the this page you can scroll through all the contacts you’re sending this Scalemail to and edit their email individually. For example, maybe you have a few contacts who you’ve talked about say, architecture with in the past. You can edit their emails to mention something like “Since I know you love architecture…” or any personal message you want. You can edit as many or as few emails as you’d like. To edit individual emails, just click on each contact’s name on the recipients pane on the left side of the screen. Next, edit the emails in the center pane. Before you hit send, choose your tracking option at the bottom left of the window. You can track opens, clicks (whenever someone clicks on a link in the email) or set a follow up reminder if the contact doesn’t respond in 7 days. Finally, choose a day and time you want to send your email and click send. Let’s face it. If you can’t track your progress effectively, your relationship marketing efforts likely won’t work very well. That’s why Contactually allows agents to create pipelines. Like programs, pipelines are customizeable representations of every step of the lifecycle of your relationship or transaction. You can create custom stages for every pipeline and apply them to individual contacts, tagged contacts or buckets. For example, a typical sales pipeline for buyers include every step of the deal from initial contact to closing. As your relationship progresses from lead to closing to former client, you can move them into the next pipeline stage to track your progress. Even better, Contactually allows you to assign a monetary value to individual leads in your pipelines. For most transactions, this value will be the transaction side (or sides), you can realistically expect once you close a deal. Once you have multiple deals in your sales pipeline, you can get a high level overview of how much your pipelines are worth to your bottom line as well as diagnose issues if you end up getting stuck too often in one stage. Creating a custom pipeline is easy. To get started, click on the “Pipelines” tab at the top of your screen. From here you can either pick a pipeline if you’re using the Real Estate Accelerator Plan, or create a custom pipeline. Let’s make a simple buyer lead pipeline to track our sales. First, click on the red “Create Pipeline” button on the right side of the screen. Next, name your pipeline, and define your goal. Then, add different steps to your pipeline. For our buyer’s pipeline, we’ll set up 6 pipeline stages, Long term leads, warm leads, hot leads, active buyer, accepted offer, and dead leads. Once you’re done adding stages, save the pipeline and then select it to add your leads to the pipeline. To add a lead, click on the red “Add Deal” button on the right side of the screen. 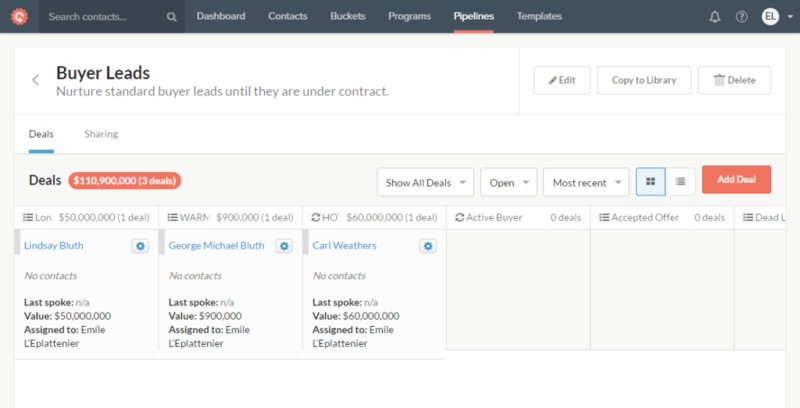 Now you can add each deal as well as the potential commission you will make to your pipeline. Now you can move each lead to different stages of the pipeline as your leads progress into clients and closed deals! Even better, you can see the total value of your pipeline at a glance. Okay, now that you’ve setup your buckets, designed a program and pipeline, let’s take a quick look at some of Contactually’s more advanced features. Sometimes a personal touch can transform a stalled relationship into a fruitful one. All it takes is a personal touch that makes you stand out from other agents. That’s why Contactually let’s you send gorgeous hand written cards to your tagged contacts or buckets right from Contactually. Even better, you can add these lovely handwritten cards to your programs to be sent out automatically on a schedule you choose. While the cards aren’t exactly cheap at $4.50 per piece, they make a great impression for your more important clients. Over the past few years I’ve had the pleasure of meeting and interviewing dozens of top producing brokers, including many at the top of the Real Trends 500. Besides perseverance, the one thing they all have in common is that they spend almost as much time thinking about the big picture as they do down in the weeds closing deals. There is a very good reason for this: If you can’t get a good look at where you’ve been, it’s virtually impossible to plan where you’re going. This is why getting an accurate, high level overview of your results is crucial for any agent, team or brokerage. Luckily, Contactually offers powerful tools to quickly and effectively identify what’s working, and what isn’t. 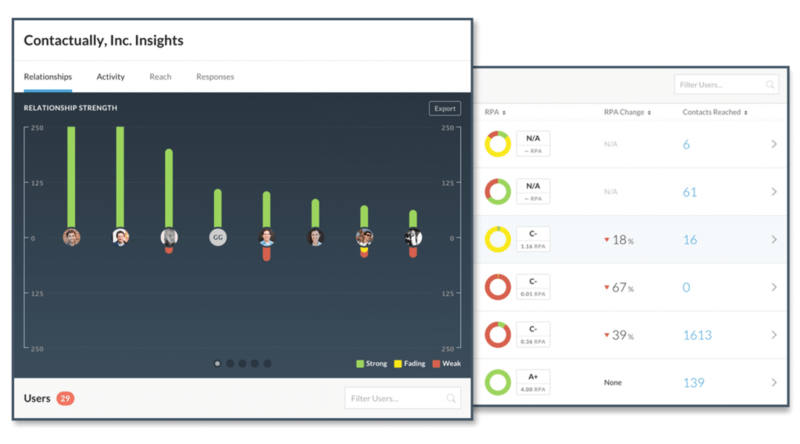 Their first (and coolest) tool for assessing your overall performance greets you on your dashboard when you first log in to Contactually every morning. Your Relationship Point Average (or RPA, think GPA from college) is an algorithmically determined letter grade that tells you how well you’re doing with your relationships marketing. If you’ve been on top of every reminder and have been actively reaching out to your contacts, then your RPA will an A or A-. If you instead decide to close outreach reminders more often than not, you might have a D+. While it may seem a little silly at first, seeing that RPA every morning soon becomes a very strong motivator for most of the Contactually users we spoke with. You may even find yourself picking up the phone just to change your RPA from mostly red and orange to mostly green. With their Professional, Real Estate Accelerator and Enterprise plans, Contactually includes even more granular insights into performance for motivated agents, brokerages and teams. You can check out the RPA and performance of each member of your team, or get an in-depth look at how your time and effort was spent on different activities. After a few months, this data will become invaluable for making big picture decisions, or tweaking your relationship marketing to increase your ROI. If you want to take your business to the next level, you need to be able to reach the right lead, with the right message, at the right time. A relationship marketing platform like Contactually is one way to help you do this consistently enough to move the dial and close four more deals this year. Emile, great article. Question for you. Under those buckets that you’ve listed, where would I put a current client where I have their listing or where would I put someone who is just about to sign a listing agreement? Thanks so much! Great article, I learned so much from this. Check out this new company called RealtyAPX, its less expensive and includes a full CRM as well as 7 other Real Estate features including lead acquisition, transaction management, showings management, it even has a built in digital signature function and it’s all for less than any single CRM above. Glad you found the article helpful. RealtyAPX looks pretty interesting, but I’m always a bit leery of products that claim to be swiss army knives. Most of the time when they claim to offer everything, they’re not very good at most things. For example relationship management is a pretty specific job, and automation and follow up reminders are a huge part of that. Very few companies do that well.